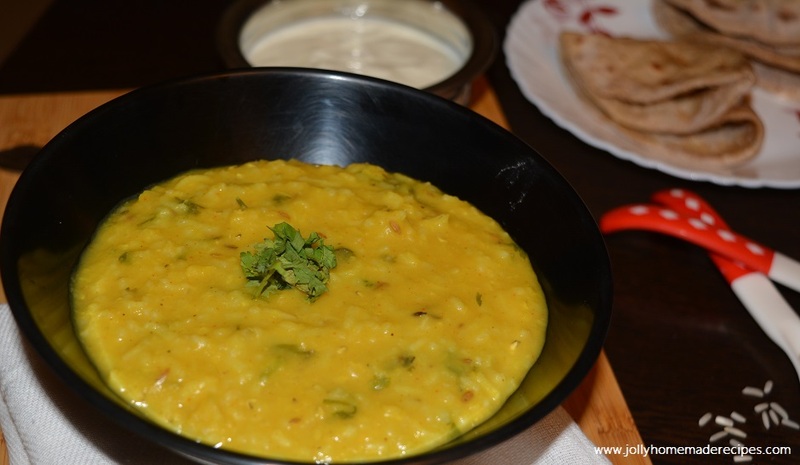 Moong-Masoor Dal Khichdi step by step photos recipe - This is one pot meal and perfect comforting food made with moong-masoor (red-yellow)lentils and rice. It is wholesome, nutritious, easy to digest and very light on the tummy. This is good for all days if you feel sick or ill, doctors will recommend you to eat light, less oily, spicy food means to eat khichdi to recovering from illness. 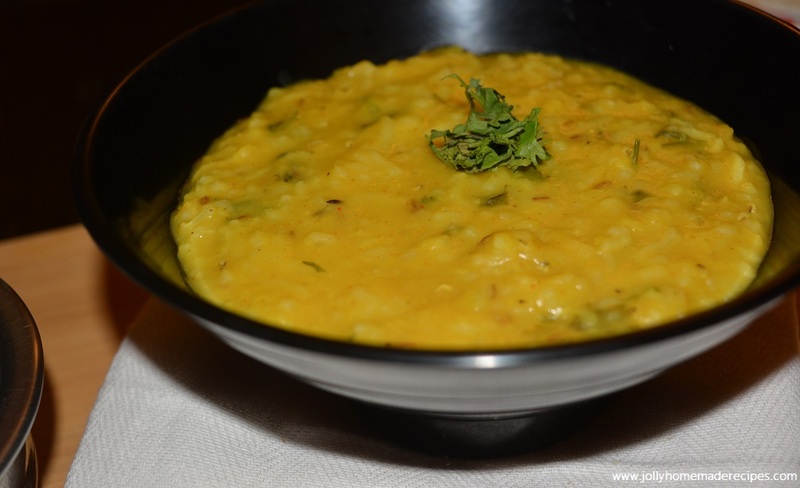 Khichdi is an South Asian preparation made from rice and lentils. It is also pronounce as khichri. This is our family favorite dish, My naughty niece Aroha and my younger sister loves khichdi very much, they can eat whole day :P :D they can survive with khichdi as their full day meal. Dal khichdi recipe is the contribution of our Foodie Monday blog hop and this week topic is "Dal/Lentils", Dal's are very commonly used in the Indian cuisine. As dals we have to prepared on our daily basis. There are good healthy benefits of dals in general is that they are very rich in proteins. 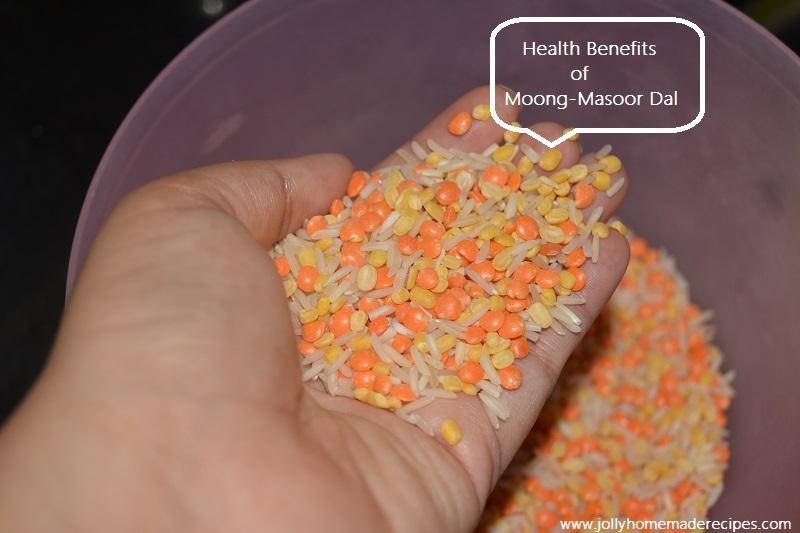 Masoor dal is improves the blood circulation in the body. 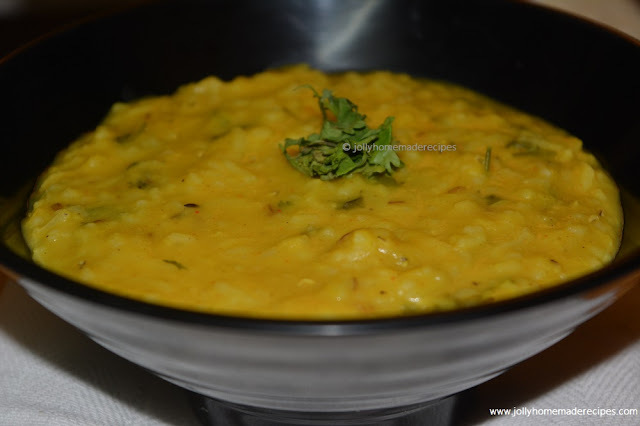 This is very simple dal khichdi made with lentils, rice with few spices, no veggies and no ginger-garlic in it, Sometimes a simple dish is all it takes, to make me feel warm and cozy. Its like that secure feeling you get while lying down on mom's lap :) It's like home. This simple dish of lentils for me is all that and more. A total comfort food. So when your stomach is upset then it is best to have khichdi and it can also be served to small babies, since it is easy to digest. 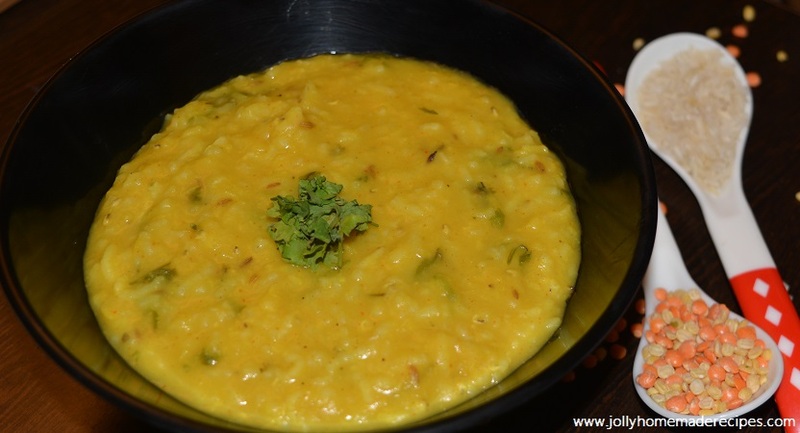 You can serve khichdi with curd or an accompanying with simple roti. I also like to drizzle some lemon juice on the khichdi..it's really scrumptious !! 1. Mix both dals and rice. 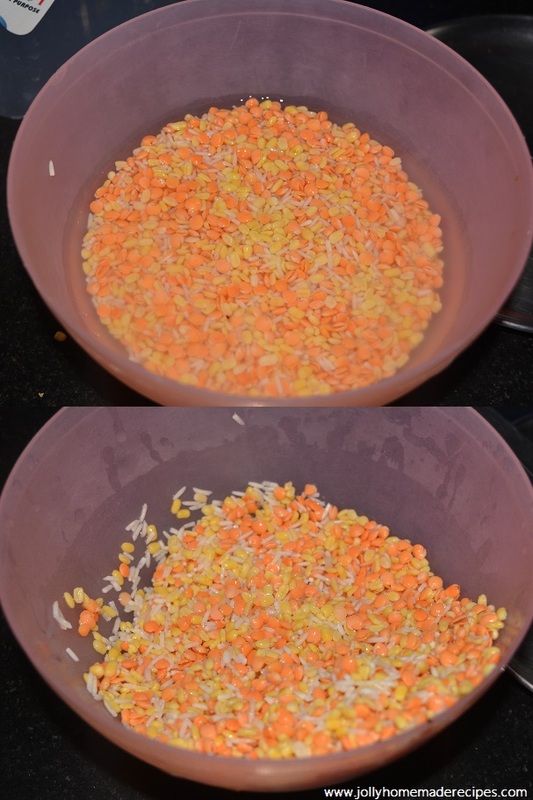 Now rinse and wash lentils and rice together. 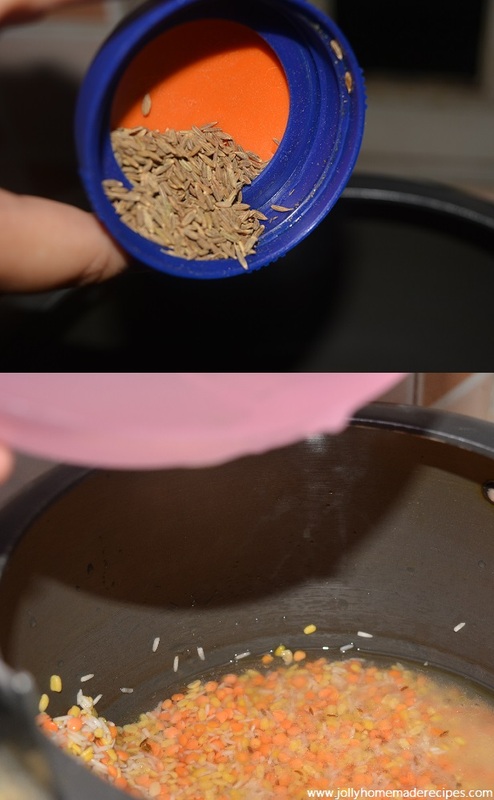 Soak both of them for 15 minutes in water, then drain and keep aside. 2. Heat 2 tbsp of desi ghee or oil in pressure cooker, add cumin seeds/jeera. 3. Now add the drained rice and lentils to the pressure cooker. Stir for a minute. 4. Add 4 to 4.5 cups of water. 5. Add spices red chilli powder, turmeric powder, salt to taste. Stir well. 6. 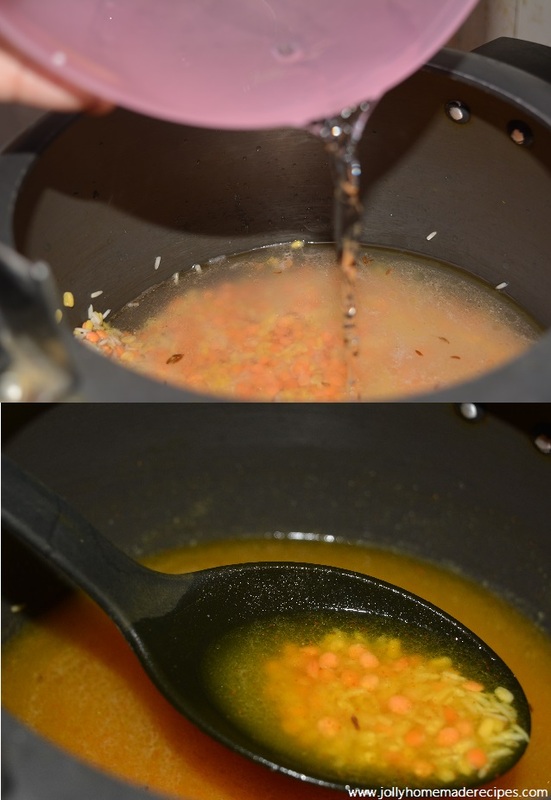 Close the lid tightly and pressure cook the moong-masoor dal khichdi on a high flame for 2 whistles. 7. Once the khichdi are cooked, give them a stir and adjust the amount of water as per your liking, if you want thick first add less water or give a 1 or 2 boil to khichdi on high flame, it become thick. Now check your seasoning, add garam masala and fresh chopped coriander leaves. 8. Serve the hot khichdi with roti or paratha's with pickles and fresh veggies salad as a side dish and good accompanying with curd or lemon juice. 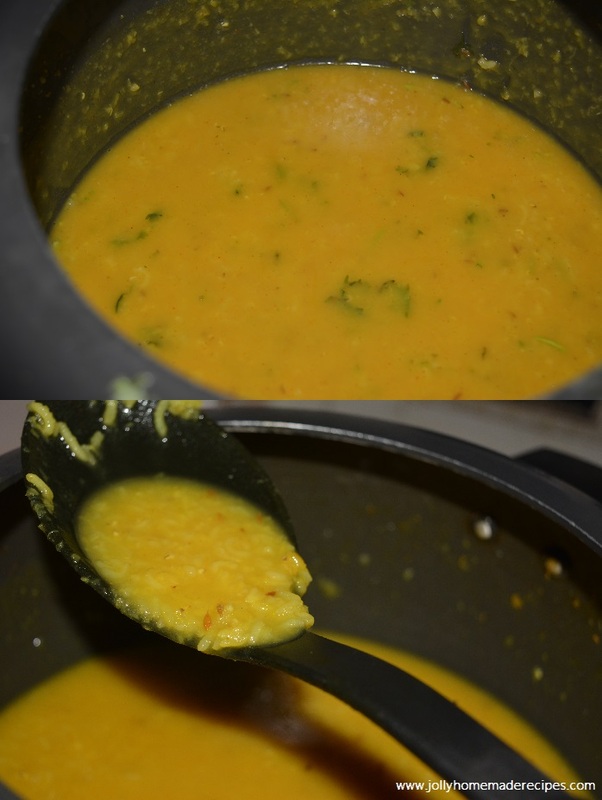 tangy sambar (toor) dal recipe and many more curries and lentils. Perfect comfort food for me..lovely. Khichadi is my all time favorite food. This version sounds great to me.. Perfect and best comfort food. Looking very delicious and perfectly made.Thanks Jolly for this great share.. Thank you so much dear Deepa, glad you liked it! Loved the Khichdi! A deep fried papad and some mixed green salad is what I would love to have along with this tempting Moong -Masoor dal ki Khichdi. Comfort food and looks delicious. A well explained recipe. Jolly, that's a very delicious looking khichdi preparation. I usually make this soft type of khichdi every week,adding little bits of veggies left from the whole week. It's a one pot meal. Will now add different lentils to it instead of just moong dal. Thank you so much Mayuri ji, glad you liked it. Alltime favorite khichdi, which is light food and comfort food...You made it perfectly Jolly!!! Delicious share!! This is a great comfort food and so easy on the system. An all time comfort food for me!! Lovely share dear. Hi Jolly, this is a comfort food, kids in my house really enjoy this.Nice to meet you through journey of blogging. Thanks for linking your recipe with MLLA, May 2016. Please come and see the round-up on 2nd June. 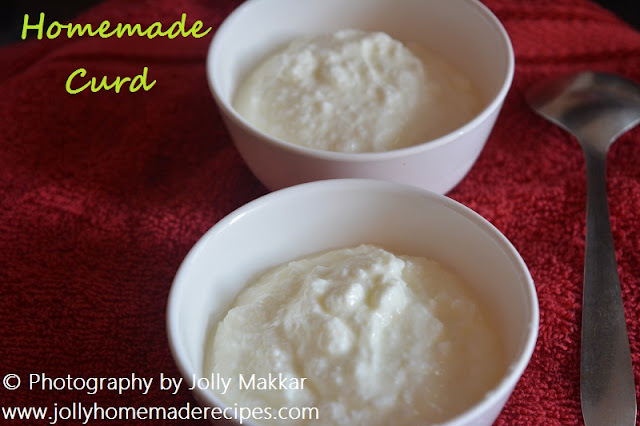 I am really honored madam that I can meet you in my journey of blogging, glad you liked my recipe and tried it at home & your family enjoyed it, thanks a lot ! !